The so-called "superstreet" traffic design results in significantly faster travel times, and leads to a drastic reduction in automobile collisions and injuries, according to North Carolina State University researchers who have conducted the largest-ever study of superstreets and their impacts. Superstreets are surface roads, not freeways. It is defined as a thoroughfare where the left-hand turns from side streets are re-routed, as is traffic from side streets that needs to cross the thoroughfare. In both instances, drivers are first required to make a right turn and then make a U-turn around a broad median. While this may seem time-consuming, the study shows that it actually results in a significant time savings since drivers are not stuck waiting to make left-hand turns or for traffic from cross-streets to go across the thoroughfare. "The study shows a 20 percent overall reduction in travel time compared to similar intersections that use conventional traffic designs," says Dr. Joe Hummer, professor of civil, construction and environmental engineering at NC State and one of the researchers who conducted the study. "We also found that superstreet intersections experience an average of 46 percent fewer reported automobile collisions  and 63 percent fewer collisions that result in personal injury." The researchers assessed travel time at superstreet intersections as the amount of time it takes a vehicle to pass through an intersection from the moment it reaches the intersection  whether traveling left, right or straight ahead. 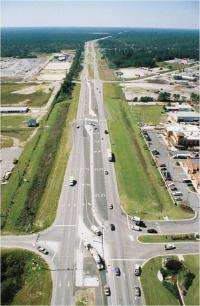 The travel-time data were collected from three superstreets located in eastern and central North Carolina, all of which have traffic signals. The superstreet collision data were collected from 13 superstreets located across North Carolina, none of which have traffic signals. The superstreet concept has been around for over 20 years, but little research had been done to assess its effectiveness under real-world conditions. The NC State study is the largest analysis ever performed of the impact of superstreets in real traffic conditions. More information: A paper on the travel time research is being presented Jan. 24 at the Transportation Research Board Annual Meeting in Washington, D.C.
Mythbusters tested the right hand only thing a few years ago and proved it's true even in normal city intersections. It takes less time and less fuel to make 3 right turns than it does to make 1 left turn, on average. They tested this with a delivery route which was a "worst case scenario, in which the right hand turns replacing left turns did not make short cuts, and it still worked. The worst case all right hand turns route used less time and fuel than the "intuitive" half right, half left route. UPS has been planning their routes using RTs for quite some time. Imagine, saving money and improving efficiency as a motivation! Damn sure works in Detroit. The only thing I liked about that city was the no left turns . . . that, and the timed stop lights on Telegraph Rd. Go 5mph over the speed limit and you'll hit every one green. Sweet. I would like to know just how many lanes are there in the road or roads they studied. In Rochester, NY they completed one of these roads about two years ago, and are in the process of building another. These roads are 4 lanes wide in each direction, not including turning lanes. IMHO, they are near hell to travel especially during peak hours. If you are not in the proper lane to turn well before you need to turn, good luck in getting into the proper lane for your turn. Unfortunately, no link to the actual article is presented in this story so the detail of how many lanes is missing, and from personal experience driving these behemoths, that data is an element that is in desperate need of study. I wonder how traffic circles compare (big circles in the intersections where everyone must turn right and go around the circle to get to their selected street)? This thing looks like a squished traffic circle. The only difference is that you can loop back at the middle rather than go all the way around. I suppose it's certainly a better land use design. But circles seem like they'd be safer (no u-turns accross traffic). I always thought the no u-turn signs and laws were big BUNK! Doooooo it already! City Planners only seem obsessed with adding new development with little attention to traffic. Work now takes an extra 2-4 hours of the day depending on traffic for a 20 mile drive! But circles seem like they'd be safer (no u-turns accross traffic). I live around many circles. They're fine when 1 lane wide. When they are 2 wide, some people just don't get it and mosey to and fro, back and forth, like they just don't care. Then again, I live in a very touristy place, so normally it wouldn't be that bad. "The superstreet concept has been around for over 20 years"
Nope. I first saw this about 50 yrs ago on Rte 1 through central NJ. Port Road in Adelaide is like this (except substitue 'left' for 'right'), and it was one of the earliest roads in the city (I think it was originally intended to be a canal, and that is why there is such a large median strip). It works pretty well, except when there is a lot of traffic as then there tends to be bottlenecks on the turnoffs. There aren't any "traffic circles" (we call them roundabouts), just normal traffic lights. Roundabouts don't work so well when more of the traffic is in one direction than the other. this thing doesnt make sense, what if you wanna go right through or turn left? It seems that the time you will gain wont overcome the time the others will lose. And if it does in fact save time then it surely consumes more gas.. Very simple, traffic keeps flowing and minimal accident rate. We have it even simpler. People joining the circle give way to those already in it, and you have to signal when you're leaving the circle so the next guy sees that he's got a gap to drive into. That would never work in DC.. circles are everywhere and they're all chaos. Circles are one of the worst ideas in the United States. One-lane circles in Europe and elsewhere are functional. Circles are well circles and are supposed to help get everyone make turns - but most planners make the circles too small -- there are some very good circles near FAU in FL which are two - three lanes wide and after you understand them its great. It will not work indefinitely. If so, they would just raise the speed limit by 5mph and eliminate traffic jams. It will break down if you stay at 5mph over the speed limit. You need to achieve that increased speed, then reduce to the speed limit. Even then, it will stop working as the number of vehicles increases. When truckers are planning their route, they always try to find a way into a place that has all left turns because right turns are often too tight for trucks. How well will these u-turns work when pulling triple sets? Let's not forget that if it wasn't for trucks there wouldn't be roads. You have never driven on Telegraph Rd.